In work that could help prevent the failure of everything from bridges to dental implants, a team led by a researcher at Texas A&M University has taken the first 3D image of a microscopic crack propagating through a metal damaged by hydrogen. "For the first time we were able to catch the crack red-handed," said Dr. Michael J. Demkowicz, associate professor in the Department of Materials Science and Engineering at Texas A&M. Previously, the only way to analyze such a metal failure was to look at the separated pieces of a completely fractured component, which entails a certain amount of guesswork. 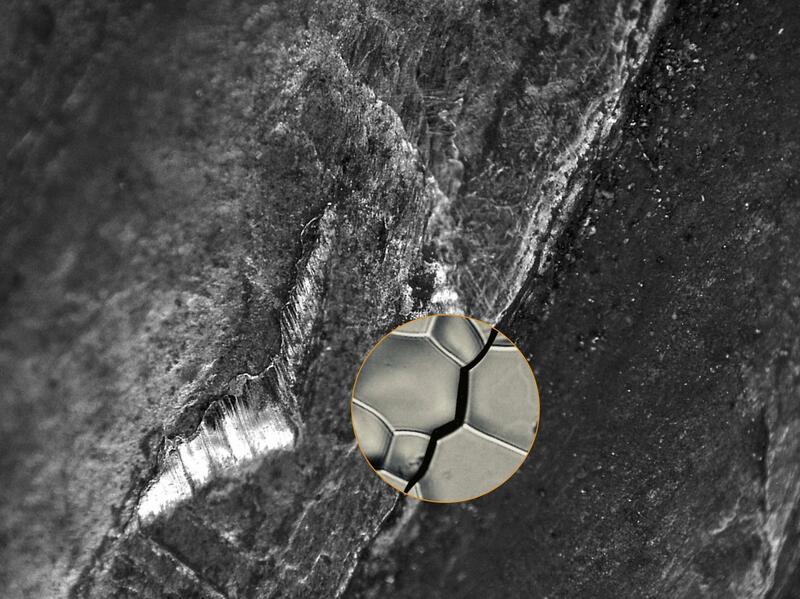 The new research shows what is happening at the crack tip as a part begins to fracture. "It's much better than arriving at the crime scene after the fact," said Demkowicz. As a result, the team identified 10 microscopic structures that make metals stronger and less susceptible to a key environmental factor–the hydrogen around us–that can damage them. Their work is published in Nature Communications. It was conducted using two powerful tools at Argonne National Laboratory's Advanced Photon Source (APS), and represents a milestone for one of those tools as the first experiment performed by researchers outside of the development team at Argonne and Carnegie Mellon University (CMU). Metals surround us in any number of structures and devices, but they can be negatively affected by the ubiquitous hydrogen around us, mostly from water. "Hydrogen gets into the metal and causes it to fracture unexpectedly in a process called hydrogen embrittlement," said John P. Hanson, a reactor engineer at Oklo and first author of the paper. One prominent example involves the Bay Bridge in San Francisco. As the bridge was being constructed in 2013, engineers discovered that 32 of the 96 huge bolts key to the structure had cracked due to hydrogen embrittlement. The problem was caught early so there was no catastrophe, but it delayed the opening of the bridge by a few years. Scientists have studied hydrogen embrittlement for over 150 years, but it remains difficult to predict. "That's largely because we don't have a complete understanding of the mechanisms behind it," said Hanson, who conducted the work while earning his doctorate from the Massachusetts Institute of Technology (MIT). "As a result, engineers have to overdesign with additional material to cover any sudden failure and that costs a lot," said co-author Peter Kenesei of Argonne, who operates the instruments used in the work. "So a better understanding of this behavior could have a huge economic impact." "You can make progress on old problems when you have new tools," said Demkowicz. The researchers employed two different synchrotron tools, high-energy diffraction microscopy and X-ray absorption tomography, to analyze the microscopic structure of a crack in a superalloy of nickel. The study represents the first time the microscopy technique was used by researchers not involved in its development. The combined experimental tool and analysis software are unique in the world. A metal is composed of microscopic crystals, or grains. In nickel superalloys, the fractures brought on by hydrogen embrittlement travel along the boundaries between those grains. Hanson said the unique tools at the APS beamline 1-ID allow for the first time to not only look at the grain orientations around a crack in progress, but also the grain boundaries. From those observations, the team identified 10 grain boundaries that are more resistant to cracks. "We were able to show not only which grain boundaries are stronger, but exactly what it is about them that improves their performance," Hanson said. This could ultimately allow engineers to build stronger metals by designing them with those characteristics. In the nearer term, the Argonne tools could be used to image the microstructure of existing metal components to better predict their susceptibility to failure. Kenesei notes that the tools are already being used this way to study other engineering materials, such as those related to airplanes, batteries and nuclear reactors. The study took eight years to complete, primarily because it involved huge amounts of data that were difficult to analyze. The raw data for the work would fill almost 400 DVDs. Further, the data looks nothing like a 3D model of the material. "It's highly encrypted in the form of streaks and dots, or diffraction patterns, that must be analyzed by a supercomputer," said Robert M. Suter from Carnegie Mellon University (CMU), an expert on the analysis. To put the challenges in perspective, Demkowicz notes that the crack microstructure is actually much more complicated than the structure of DNA, which Watson and Crick determined through the same general process, but by hand. The work was supported by the BP-MIT Materials and Corrosion Center, the National Science Foundation, and the U.S. Department of Energy.